Texas Governor Rick Perry made his first court appearance on Thursday to face felony charges for abuse of power, a case that has cast a shadow over his possible run as Republican candidate in the 2016 presidential election. The pretrial hearing is expected to address procedural matters concerning his indictment. Perry’s office has said he will speak after the hearing at a criminal court in Austin. In recent trips to key states in presidential primaries, Perry has tried to use the criminal proceedings to rally support within the Republican Party by portraying himself as the victim of a partisan prosecution. Perry has ranked near the bottom of possible candidates among Republicans in support polls but has seen a slight increase in support since the indictment, which came as he was gaining national attention for attacking the Obama administration over its immigration policies. But the case could scare off major Republican donors in the party who see it causing long-term damage that would make it difficult for Perry to win the presidential race if he is nominated, analysts said. Perry was indicted in August by a grand jury in Travis County, a Democratic stronghold in heavily Republican Texas, over his veto of funding for a state ethics watchdog that has investigated prominent Texas Republicans. He was charged with abuse of official capacity, a first-degree felony, and coercion of a public official, a third-degree felony. Perry, the longest-serving governor in the state’s history, became the target of an ethics investigation last year after he vetoed $US7.5 million in funding for the state public integrity unit run from the Travis County district attorney’s office. Perry’s veto was widely viewed as intended to force the resignation of Travis County District Attorney Rosemary Lehmberg, a Democrat, after she had pleaded guilty to drunken driving. 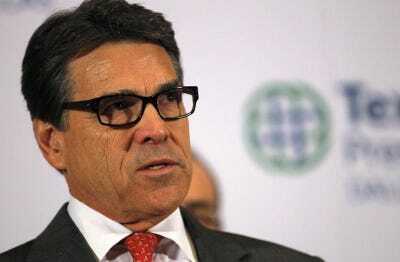 Opponents have said Perry may have been looking to put an ally in charge of the unit, extending what they say is cronyism in his administration. Perry has been governor of Texas since December 2000 but did not seek re-election this month as he tests the waters for another presidential run. He dropped out of a gaffe-filled campaign for the 2012 Republican presidential nomination but has been attempting a political comeback.